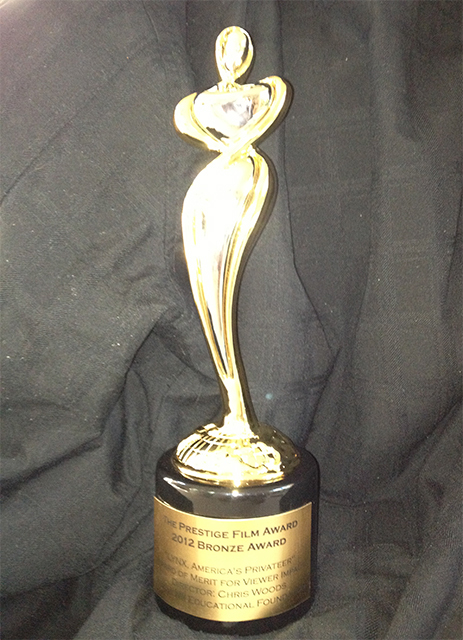 “LYNX, America’s Privateer” Award of Merit for Viewer Impact. Director: Chris Woods. National Maritime Historical Society 2011 Walter Cronkite Award for Excellence in Maritime Education. On behalf of the trustees of the National Maritime Historical Society I am honored to have the Society present you and the 1812 reproduction Lynx with the NMHS Walter Cronkite Award for Excellence in Maritime Education at the New York Yacht Club at our 2011 gala awards dinner on Wednesday 12 October. The award is presented to you for your design, building and crewing the 1812 privateer Lynx, but most specifically for creating the Lynx sailing program to incorporate sail training with a hands-on educational experience of history. The NMHS Walter Cronkite Award for Excellence in Education honors individuals and organizations whose outstanding achievements in maritime education bring history alive for young people, providing real life results and getting young people involved in the continuous process of learning that will have a fundamental impact on their lives. The award recognizes work that teaches maritime history in a way that conveys the challenge, excitement and leading role of our seafaring past in creating today’s world. Past recipients of this award include David Rockefeller Jr. and Sailors for the Sea; Joyce Huber Smith and the Sultana Projects Inc.; Alix T. Thorne and Ocean Classroom Foundation; and Rafe Parker and the SEA Education Association at Woods Hole. William H. White recommended you for this award. Founded in 1963, the National Maritime Historical Society is a not for profit membership organization whose mission is to raise awareness and the role seafaring has played in shaping civilization. With a membership of 10,000 strong, the Society initiatives encompass publications, educational programs, sail training and preservation of historic ships. The Society communicates with its members through its quarterly publication Sea History, which is recognized as the pre-eminent journal of advocacy and education in the field. 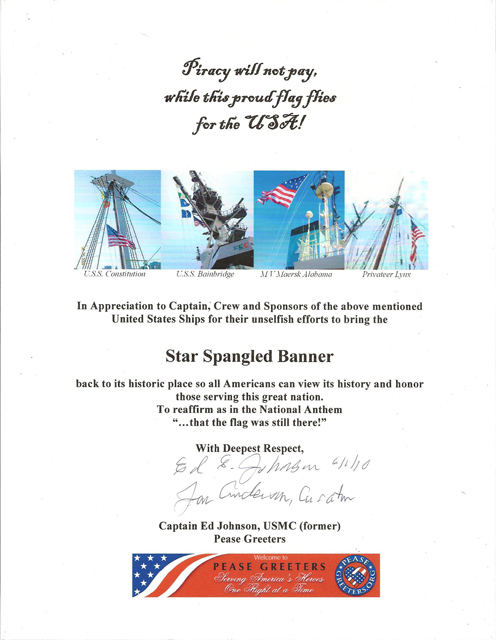 On behalf of the captain and crew of Privateer LYNX, the Tall Ship Lynx is proud to accept this award for promoting the history of the Star-Spangled Banner. The Pease Greeters are a volunteer group of American citizens who welcome home returning American soldiers from combat at the Pease Air Terminal in Portsmouth, New Hampshire, homeport of Lynx. We thank them for this honor and we encourage others to support their mission. Tall Ship Lynx won this prestigious award for 2008. It was presented in Halifax, Nova Scotia, by ASTA President, Mike Rouworth. The award was accepted by Cindy Buffa, Director of Education and Sail Training Lynx Educational Foundation.